Implants provide an alternative to traditional crowns, bridgework and dentures. Implants result in greater comfort and confidence as they feel and look like natural teeth. A dental implant is a titanium "anchor" that is inserted into your bone in place of a missing tooth. After the bone heals around the implant, a replacement tooth is secured to the top of the implant. The result is a restoration that functions similarly to the rest of your teeth. Our office uses Zimmer Dental implant systems and refers to a specialist for the initial placement of the implant. For more information on how implants work, their benefits and what is involved in the process, click here. Decay is best caught and removed in its early stages before it impacts the overall health of a tooth. Dr. Ioset uses only the highest quality materials in restorative procedures. Composite is used in almost every procedure. Composite is a very strong, durable material that wears similar to enamel; your tooth will look as though it never had a filling as the composite matches the shade of your tooth. As a rule, our office rarely uses silver amalgam. Have you broken or chipped a tooth? Is there something about your smile that bothers you? Bonded restorations and esthetic procedures allow us to repair your teeth and perfect your smile. 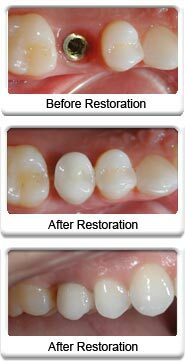 Restorations can reshape a tooth or fill in gaps between teeth. These procedures can restore the functionality of your teeth and can give you a smile that you want to share with the world. Crowns restore strength to teeth that have been severely compromised by decay and large restorations. Bridges replace teeth that have been lost. Veneers are thin porcelain facings that are used to resurface and recontour anterior teeth. Veneers provide a way to improve the esthetics of your smile.